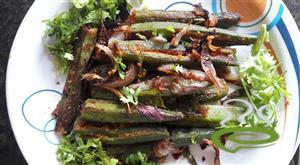 Bitter Gourd Fry (Pavakkai Poriyal) is an authentic delicious side dish that goes perfect with hot steamed rice. 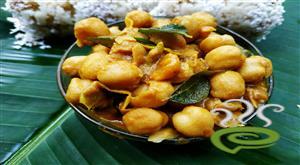 Termed “pavakka” in Malayalam, Bitter Gourd Fry is a nutritious dish having several medicinal as well as health related benefits. Bitter Gourd improves immunity and fights against infections. Bitter Gourd helps curing diabetes related problems too. The bitterness of the vegetable can be reduced by soaking in salt and later washing in cold water. But the original bitter taste of Bitter Gourd Fry always tastes perfect. Sharing an easy to prepare Bitter Gourd Fry well illustrated in simple sentences. Chopped bitter gourd pieces are cooked in a chilly mixture and later fried to a crispy brown color. Enjoy Bitter Gourd Fry. 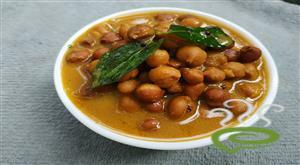 Add mustard seeds and when they splutter, add the chopped onions and fry till brown. 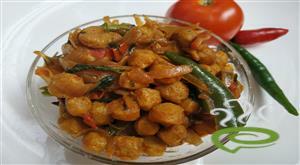 Add chilly powder and coriander powder and fry till the raw smell of the masala disappears. Add the chopped bitter gourd and stir for sometime. Add a little water and allow it to boil. Add jaggery, curry leaves and salt and keep the pan closed. 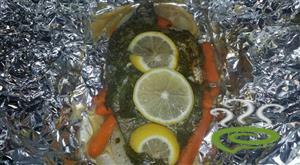 Allow the contents to cook and let the water evaporate. Add oil and fry the contents. :- Bitter Gourd Fry is ready. 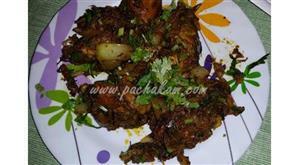 :- Serve Bitter Gourd Fry with rice. 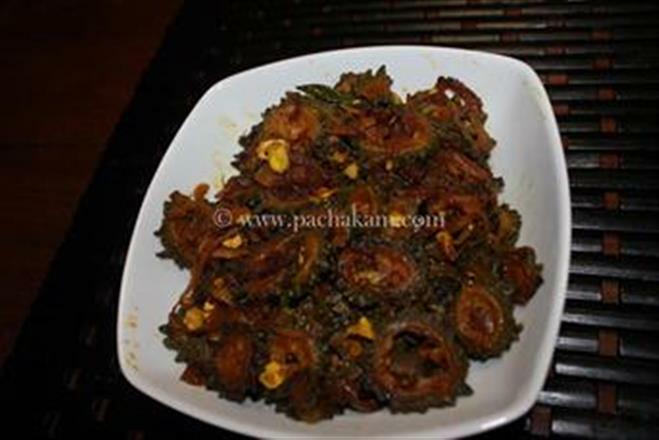 :- This Bitter Gourd Fry is a very different variation from the regular Bitter Gourd Fry. :- Enjoy the Bitter Gourd Fry. Very nice recipe. I added some tamaring pulp to this. It was very nice. I couldnt find it that tasty ! 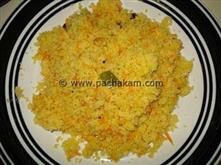 A very good recipe & thanx for sharing it. You are right. This is just for one adult. Pavakkai really shrunk to very little. That made it tasty and precious. Next time I will make more. It is really a delightfull recipe on bitter gourd! !